RV, motorhome, and camper owners can be tricky to shop for! 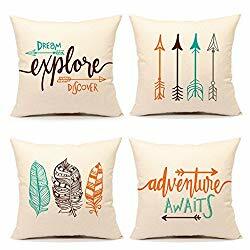 They are dreamers, adventurers, and love to receive practical gifts for their lifestyle. Whether you are searching for RV gift ideas for someone living the RV life full time, or for an RV enthusiast who camps on the weekends only, you will find the perfect gift here! 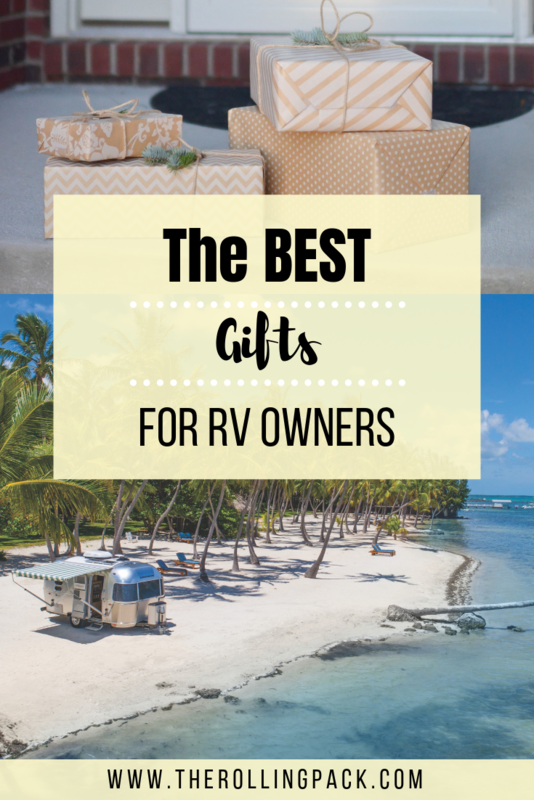 In this complete RV gift guide we will share some of the very BEST gifts for RV owners! Click on the names of any of these products to check prices! One thing that ALL RV owners have in common is the need to save space in their motorhome. This produce hammock is the ultimate way to store things without taking up counter or cabinet space in the camper. We use our produce hammocks to store way more than just produce! We have one hanging in our RV bathroom that holds all of our toiletries. These hammocks are especially great because you can leave them hanging while you drive! That means you can get on the road faster and easier, and who doesn’t want that?! One of the very best RV gift ideas is an inflatable kayak! Most RV travelers love to camp near water, and having a watercraft makes camping near water even more fun. Sea Eagle makes high quality, durable, inflatable kayaks that are easy to store. Since we love to camp on the beach, our Sea Eagle kayak has gotten plenty of use. Plus it’s simple to inflate/deflate. We have seen lots of these Sea Eagle kayaks on our travelers, and everyone loves them. We even met people who fish from these kayaks, they’re very versatile! 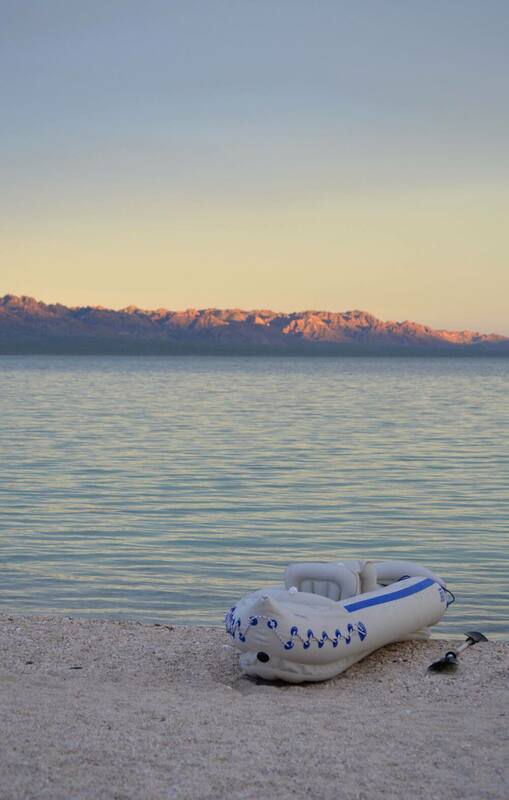 Our inflatable kayak is probably our favorite RV accessory, and if you really want to surprise the RVer in your life with a great gift- this is it! No travel trailer is complete without some cute RV decorations! We particularly love this sign, and a big advantage to a hanging sign is that it is easier to mount on an RV wall than a regular painting or framed piece of art. This is because hanging signs are made to move around while you drive without falling off the wall! This small speaker produces a big sound, and is small enough to go anywhere with you! 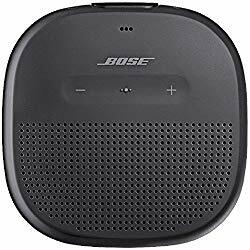 It’s really nice to be able to play some music at your campsite, and this speaker is small enough that it can easily be brought on hikes or picnics. One of the best gift ideas for RV owners is the gift of entertainment. Motorhome owners are constantly going on long road trips, and it’s great to have something to help pass the time when driving. Amazon Audible gives you access to a huge selection of audiobooks, and is an awesome entertainment option for those long hours on the road. This solar-powered lantern is one of the very best gifts for RV enthusiasts. These Lucy light lanterns deflate down into a small, flat solar panel that can be hung or set pretty much anywhere to charge (we usually stick ours on the hood of our motorhome during the day). Then, when the sun goes down, you just easily inflate the lantern, and you have a beautiful, warm light that will last all night on a single charge! We actually have a few of these Lucy lights, because you can place them all over your campsite for a lovely lighting effect. We love this particular set of leveling blocks because you get a LOT of blocks, and there have been times when we need to use ALL of them in order to level our rig. In the photo above you can see these blocks in use under our rear dual tires. Campsites on the beach like this often require plenty of blocks to get level! This is an awesome motorhome gift, because leveling the RV is one of the most frustrating parts of RV travel! These leveling blocks can get your camper level anywhere, even on a very uneven or sloped campsite. It can be hard to find RV gifts for mom! Luckily these cute RV cushion covers make a great gift for any RV-loving lady. Their inspirational messages are a nice reminder to live life to the fullest. Camper life is so much more comfortable when your RV is decorated to feel like a home! RV camping is the very best at the beach, but camping in sand comes with a high risk of getting stuck! Motorhomes are so heavy that is very easy for them to get stuck, and getting them out can be a real challenge without the right equipment. Enter Maxtracks brand sand tracks. If your camper gets stuck in sand you wedge these tracks in right in front of your tires and you will be able to drive out of the sand onto the tracks! These are pricey, but so worth the money. Getting stuck in sand or mud can be a very stressful experience for a motorhome owner, and often that stops RV travelers from camping in more remote areas. Some of the most beautiful campsites in North America are off the beaten path, and a pair of Maxtracks will allow you to venture off paved roads with far more confidence! While brand new RVs come with backup cameras these days, the vast majority of RV travelers are not driving brand new RVs! For those older motorhomes, the modern technology of a backup camera can make life SO much easier. These are an especially great gift for the solo RV traveler in your life, because they don’t have a partner who can get out of the car and help them back into a tight spot! This is one of the coolest gift ideas for RV campers we’ve seen! 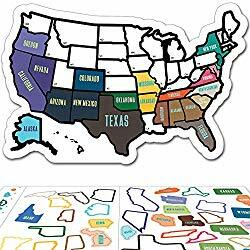 Rvers can put this up inside their RV and keep track of all the states they’ve visited, and which ones they still need to check out. This is such a fun decoration for your camper! Weatherproof mats are a must-have RV accessory! These mats are so versatile- they can be used in front of your RV’s front door to create a patio area, they can be used as a beach blanket, or even as a yoga mat! When we are traveling by motorhome we use our weatherproof mat on a daily basis. Tiki torches are such a fun campsite decoration, but they can be dangerous since RVs have lots of flammable components. A safer, and more durable, option is this set of solar powered tiki torches that have a flickering light that looks like real candlelight! When you’re camping somewhere for a week or more it’s a lot of fun to personalize your campsite, and these tiki torches are an easy way to add some mood lighting to your space! Trusted Housesitters is a company that connects homeowners with housesitters. Housesitting is an awesome way to get free accommodation while you travel. Many RV travelers are also homeowners, and when they’re away they may want someone to watch over their house. A trusted housesitters membership can connect them with trustworthy housesitters! Grilling out is one of the best parts of camping! While many campgrounds and RV parks have grills available, they are often heavily used and not the cleanest. Aa table top propane grill is the perfect answer to the public grill problem! This awesome piece of RV gear can be set right on a picnic table, and will allow you to grill up your own steaks, burgers, and veggies without needing to haul charcoal. A screen tent is an awesome addition to any campsite, and we cannot say enough good things about the Clam brand pop-up gazebo. Not only does it go up in about 30 seconds, it also can withstand heavy winds, and can be taken down in 30 seconds as well. Solar power opens up a whole new world of camping possibilities for RV enthusiasts. When you can recharge your coach battery without ever needing to turn on your engine you can camp anywhere without having to worry about electrical hookups! This 120watt suitcase style solar panel is perfect for keeping your RV coach battery charged. You just clip the leads onto the coach battery and set the panel in the sun- simple! This solar panel easily charges all of our lights, our water pump, our personal electronics, and our portable speaker. This is a simple item that every RV traveler should have! There are so many different uses for a bucket- dish washing, hauling water, etc. The only problem is that hard-sided buckets are difficult to pack. This collapsible bucket is fantastic because it packs down flat so you can store it anywhere. We use ours all the time! RV travel is so much fun, but it can also be a lot of work. Sometimes it’s great to just relax in a hotel room for a night! Use the search box below to find a hotel room to gift the RV lover in your life. Hopefully now you know just what to get that RVing friend of yours! If you’d like to read more about full time camper life check out our camper life FAQ and answers. We don’t just travel by camper! We spent the last winter backpacking Southeast Asia with just a carry on. In the summers we festival hop around the USA, and we never miss Burning Man!